I am changing fingerboards on a early 30's Duolian, and much to my surprise, there actually is a round metal tube as a reinforcement. Has anyone else seen this. Have not ever heard about that. Curious, how straight was the neck? Round or square? National before or after Dobro took them back? I've never heard of a reinforced National (or Dobro) neck in that timeframe. I have a 1935 Dobro with around 1/8" of relief, I need to take the fingerboard off and straighten it. this looks for sure original, nicely machined "cap" over the top. Only discovered it when the FB came off, and it lifted....I thought, HOLY CRAP!! A rare earth magnet should tell you what might be under the fingerboard in case there's any doubt. Brian Evans wrote: Curious, how straight was the neck? Round or square? National before or after Dobro took them back? I've never heard of a reinforced National (or Dobro) neck in that timeframe. I have a 1935 Dobro with around 1/8" of relief, I need to take the fingerboard off and straighten it. This made me curious about my 1932 Dobro type 27 so I waved a magnet around its neck. Nothing ferrous. However after 80 years and a lot of phat strings and weird tunings the old gal has only about a business card of relief and still has the original frets. Mine is a roundie, I play it both Spanish and lap style. Great story, Brian, thanks for sharing it. 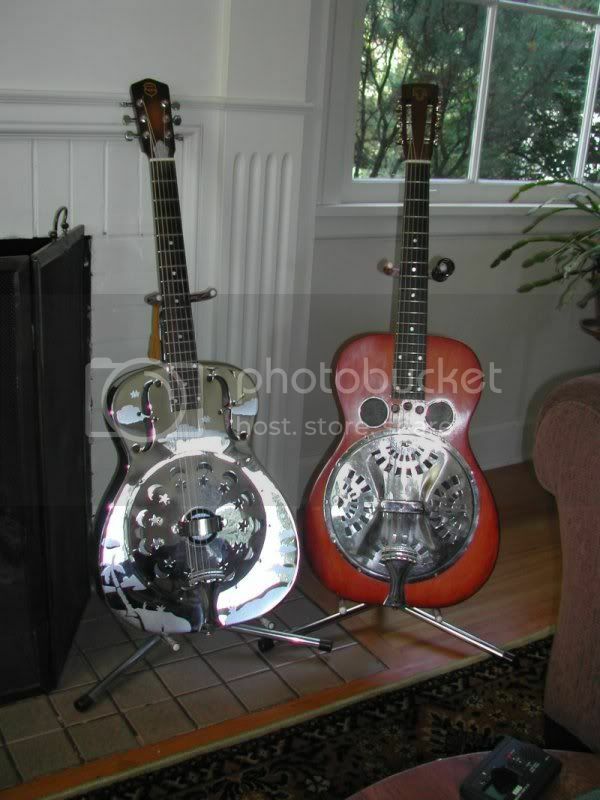 Mine also has a bit of a tale - I already owned one resonator when my local music store called - a lady had brought in an old guitar that had been in her family for a long time. She said it was her father's guitar and he had bought it when she was born, in 1932, thats how she knew its age (Dobro serial numbers are anything but straight forward). The guitar had knocked around the family and she felt it was time to part with it. It was pretty beat up, spray painted black, the cone cover was crushed. I took pity, gave her way more that it was probably worth and set about to make it right again. Stripped the finish, did a mild edge burst (they way she described it wasn't a dark burst like you see on many). Built a jig to straighten the cover plate, had to buy a new Continental cone, replace the tuners. Neck is almost dead straight, a small piece of binding missing. Took it back up and played if for her, she wept. I jump around with different tunings - because its a roundie I can play it either lap or Spanish style. Right now its got a nut extender and is tuned to normal open G, I've tried high bass G and can really see the appeal of the second complete triad, but I'm a blues guy instead of bluegrass so open G works better. When I take the high nut out I can play in G or D, the intonation is so terrible that I don't even try fretted play. Like yours, another old guitar with a lot of great stories buried inside. Its one of my least valuable guitars, but I'd still grab it if my house was on fire.